Boys, like the girls, you too have the each and every right to adopt the new trend and upcoming fashion. Boys!! there is a secret to dressing “fashionably” in a woman’s eyes and it does not always match your belt to your shoes or your tie to your shirt. Ironically, the top secret to looking good for men is the opposite of what most women try to do when we dress to impress. 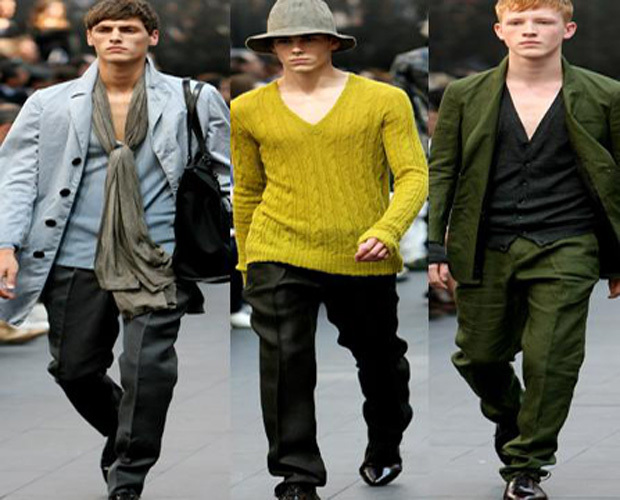 Men your top secret key to fashion is an effort. We have also brought various fashion tips for boys as well. From informal to dressy, there are many fashion options for boys. For daily wear, combinations of jeans and t-shirts, sweaters and button-up shirts are always appropriate. As well this basic combination can be dressed up to fit other occasions. Rather than jeans, khakis or more formal trousers can be substituted and a good blazer or jacket can be added. Most significantly though, the clothes must feel comfortable. Try to be different from the normal way of appearance. Wear a golf t-shirt or a cotton shirt on top of a jeans. A jeans match even with formal as well as casual shirts. Wear dresses in which you feel comfortable. Fill in your wardrobe with such dresses and you can try a variety of combinations. Put on a jacket to appear different. It provides enough ruggedness at the same time protecting your body from extreme weather conditions. Matching is very essential. Make sure that the colors of your clothing match. Don’t mix patterns. Don’t be sloppy. Make sure that all clothing items, even tee-shirts, are wrinkle-free. Also, always tuck in your shirt tails when wearing a tie. Sagging pants are not attractive. No matter how fashionable it may appear no one – not even teenage girls – wants to see your underpants. Invest in – and wear – a belt. When wearing shorts, wear ankle socks or slouched higher socks. Do not pull longer socks up the calf. Also, don’t pair sandals with socks ever. This is a big fashion fake pas. Stay away from tapered-leg pants. They usually tend to look obsolete and unfashionable. Choose wide-leg or boot-cut styles for a more up-to-date look. Find jeans and other pants that sit at the base of your natural waistline. Pants that are hiked above the waist bring about images of world-famous nerd Steve Urkel. For particular occasions, find an oxford or button-down shirt that fits correctly in the neck. Ask an associate at your local department store to measure your neck to get a good fit. The top button of your shirt should always be buttoned when you wear a tie. Also, choose a tie that falls to the top of your belt line. Styles that fall short of this point tend to look stupid When tucking in shirts, be sure to pull them out just a bit so that they blouse slightly over the waistline of your pants. Experiment new combinations from the existing wardrobe. Select your dresses that are durable so that they can be used in a rough manner. Yoga is a practice which has been started from long ago to keep oneself fit and fine. Nowadays, it is becoming a trend. There are a number of fitness centres or yoga centres which are growing to provide training for this.It combines posture exercises along with breathing exercises which help in intake of more oxygen. This helps in burning the fat efficiently. The other benefit of it being your blood is cholesterol free. Even though yoga has been around for ages, a new type of yoga focusing on toning and slimming the body down has surfaced. More geared towards the western world where weight gain and obesity is such a big problem, yoga can be applied in this area of life too. It is a very gentle way to stretch and tone the body and makes it suppler again. Yoga might not be the best option exercise-wise if you want to lose weight quickly and mainly through exercising, but yoga can help you on your way to a slimmer and more toned body. Yoga weight loss means losing weight that stays off if you keep practising yoga after losing weight. Losing weight with yoga means focusing on yoga postures that help raise the metabolism and helps to burn calories and reduce stress at the same time, as yoga is a relaxing way of exercising. Yoga does burn fewer calories than other sports such as jogging or swimming unless you practise ashtanga or power yoga. However, yoga should be practised within a certain frame of mind. Both Bikram yoga and Astanga yoga appear to be the most suitable methods. Bikram hatha yoga is the kind of yoga that most athletes and celebrities prefer as it helps to lose weight by burning lots of calories if you do the exercises at least ten times a month, on a regular basis. Bikram yoga weight loss occurs as this type of yoga is a mix of calmer yoga exercises with a complete cardiovascular, aerobic and fat-burning workout. It might take you a while to get into the speed with which these exercises are performed as Bikram yoga does not leave much time for relaxing during its exercises. But then again, raising the heartbeat and burning fat for at least twenty minutes is absolutely necessary to lose weight quicker. Bikram yoga will make you look and feel better and as you are losing weight this type of yoga will also help lower your stress levels. While training the body, you are also training the mind with this type of exercise as Bikram yoga helps to build self-control, patience and concentration. Ashtanga yoga is a type of yoga that helps make doing yoga and losing weight at the same time easy. This system of yoga focuses on synchronizing the breath with a series of different, fairly complicated, postures. The result of doing Ashtanga exercises regularly is a healthy body with a strong and clear mind. This is a very effective type of yoga for weight loss. Utilizing the spiritual and mental side of yoga when you are trying to lose weight is imperative. Changing your mentality and gearing your mind towards feeling better about yourself and being convinced that you will be successful in changing yourself for the better is necessary to be successful when you opt for yoga for weight loss. Weight gain in excess or Obesity has become a problem amongst many people in India. In this age of fast moving world, we are least bothered about what kind of diet we take in and there is the least consideration we give to being physically fit. Some people end up taking medicines and other diet control methods for weight loss. These may have some side effects. But yoga is one of the best and safe ways to achieve weight loss. Performing yoga everyday morning helps in reducing weight substantially.The logic behind the weight loss due to yoga is simple. You gain weight due to the excess of intake of calories and leading a sedentary lifestyle.The result being calories being stored into your body as fat.So it is important that you burn those extra calories to stay fit and under controlled weight.Performing yoga helps you burn those excess calories and helps in considerable weight loss. Sometimes weight can increase due to lower metabolism rate. This could be due to the inefficient working of Thyroid gland which controls the metabolism rate in our body. So the hormonal disturbances of the thyroid gland may lead to weight gain.Yoga helps in controlling thyroid hormone levels.With this, the metabolism rate also becomes steady leading to weight loss. Shava asana (corpse) marks the end of all workouts including yoga. You need to lie down on your back on a carpet with feet and palms comfortably away from the body. Starting from toes, concentrate on each organ of the body in order to relax fully. Let your breaths calm down automatically. Relax in this position for 10-15 minutes. This is one yoga exercise for back pain that soothes even as you do it. Cat stretch is a part of Chaturangasana, so it can’t be done in exclusivity. Rest on knees and palms just below shoulders (4 limbs). Breathe a cycle, holding your spine as straight as possible and looking forward. Crouch inwards trying to round the spine and attempting to gaze at the navel. Exhale while doing this and take a couple of breaths here. Come back to original position inhaling. Now go forward to the cow stretch from here, by dropping the back and lifting head as much as possible. Return to the original position after a couple of breaths while exhaling. Yoga can be practiced at home if guided properly. Easy to do the exercises. Helps you gain muscular strength apart from weight loss. Yoga at early morning is very useful.